What makes a better Halloween party theme than classic 80's horror movies? Your guests will be delighted (and scared silly) to be to see Freddy, Jason, Michael Myers, Chucky, Pinhead, Pumpkinhead, and even those creepy twins from The Shining. 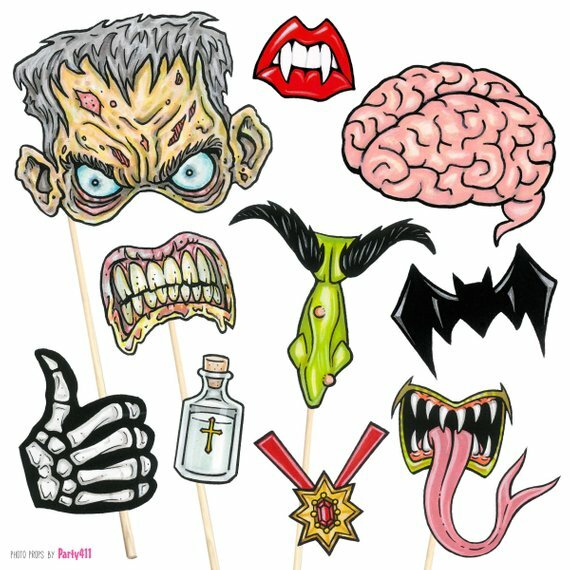 With hundreds of 80's horror movies to draw your inspiration from, this Halloween will be a horror blast from the past! We created an 80's Halloween Horror Movie Invitation that will scare the living daylights out of your guests (hopefully they will still RSVP!). You can always make your own horror movie invitation. Draw off of the movie. You can create a invitation to "Camp Crystal Lake", or send a sleep eyemask with a tag that invites guest to a "Nightmare Halloween Party". There is also a large selection of Halloween invitations to give you inspiration! Hang an 80's Halloween Horror Movie Banner above your door that welcomes guests to your party. Personalize with a message like "Welcome to Camp Lake Crystal" or "You've arrived at Bates Motel (no vacancy)". Put a "Elm Street" street sign at the end of your driveway. The nightmare is about to begin! Silhouettes of Jason, Freddy, and It in your windows will give your guests a scare! Use red backlighting for a creepy glow. Don't forget the jack o'lanterns! Bonus points if you carve one to look like a hockey mask! Set up a photobooth area where guests can take photos with their favorite 80s monsters. Stack a bunch of scary halloween photo props nearby so friends can get creative! Write "One, Two, Freddy's Coming for You" in red paint on any mirrors. Add paint splatter as blood. Put red balloon bouquets in the corners and add an "It" clown mask as a balloon weight. Scatter bloody (toy) machetes, daggers, and axes in corners and as decoration on your buffet and bar. Hang torn cheesecloth splattered with red paint and fake halloween chains all throughout your party space - on your mantle, along railings, and in doorways. Give your party a spooky glow with blacklighting and candles, too! If you really want to scare the bejeezus out of everyone go with a few gory props. Fake bloody body parts, sacks of eyeballs, and dismembered heads are a must! Spattering white plastic tablecloths with red poster paint for a gory table decoration. Add piles of bloody body parts as a centerpiece for each table. Don't forget your bar! Have your bartender dress as an iconic horror film star (Freddy, Jason, Chucky or Pinhead would be perfect). Have them pass out brews with personalized 80s theme beer bottle labels and waters with matching 80s horror movie water bottle labels. During the film screening, serve boxes of movie theater candy and tubs of movie popcorn. It is a movie-themed party after all! It's a shocking spread, everyone will agree! A horror film screening is a must at your 80s Halloween party! Whether you go current or classic, your guests will love a good scare! Send your guests home with a spooky souvenir from your 80s horror party. The perfect favor is a personalized 80s theme candy bar wrapper that matches your invitations! Set up a candy buffet with bloody red M&Ms, licorice, red hots, and lollipops. Add gummy eyeballs, brains and skulls. Guests can fill a personalized halloween favor bag before heading home! Since this is a movie-themed party, fill movie theater popcorn boxes with freshly popped kernels. To each box add a "bloody" handprint (use red poster paint)! Guests will never forget your 80s horror theme party. They'll be having nightmares about it until next year's party!